With the pace and competitiveness of business today, it’s no secret that customers expect accurate orders to be delivered on-time and damage-free, every time. Putting cost-effective processes and technologies in place to improve workforce and workflow performance is vital to the success of your operations. The CK3X fits your timetable for achieving such results with a pedigree of proven success, easy deployment and fast return on investment. Extending the popular ergonomic design of the CK3 model, the CK3X takes the best and makes it even better, giving you the power to put accuracy and productivity in the hands of your workers. 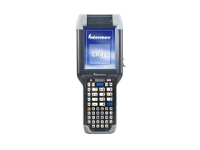 The CK3X comes with a choice of integrated area imagers for standard range or near/far range scanning. 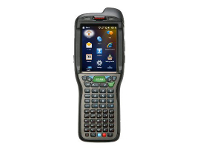 These imagers provide unsurpassed scanning performance on 1D and 2D bar codes and are particularly well-suited for reading poor quality and damaged codes. Support for omni-directional scanning and very high motion tolerance allows workers to capture an accurate scan and quickly move to the next task. 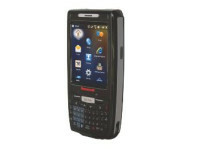 Featuring a highly adaptable design, the CK3X is supported by an 802.11 a/b/g/n and Bluetooth® radio, as well as an optional RFID reader accessory. When outfitted with Vocollect Voice you can combine the proven results associated with voice-directed workflows or combine it with traditional barcode data collection all in the same device. Avoid downtime with a device that is truly rugged. The CK3X can withstand multiple 1.5 meter (5 ft) drops to concrete (across all operating temperatures) and delivers industry-leading battery life performance that will last through a full shift and beyond – no more interruption to replace or recharge batteries. Best of all, this comes without the bulk and size of traditional rugged devices in the same class. Transitioning from other computers to the CK3X is easy with device configuration tools like CloneNGo our breakthrough device provisioning that makes it easy to “clone” device settings from a single master unit to an unlimited number of devices. The latest Microsoft® Windows Embedded Handheld operating system and broad compliance for the latest emerging industry standards such as HTML5 means the CK3X is compatible with the widest range of software applications -from warehouse management systems to other mission-critical tools developed by our PartnerNet Independent Service Provider (ISV) community. Legacy applications are backwards compatible, and the optional Intermec Client Pack includes Terminal Emulation and a lock-down browser which simplify migrations. Plus the CK3X is compatible with most existing CK3 accessories so you can upgrade to the latest technology, without additional investment in chargers, docking stations, scan handles and more. Take your business performance to the next level with CK3X. As part of Intermec’s proven enterprise business solutions, the CK3X extends your data collection options while reducing IT burden – giving you a true competitive edge. Both keypad options feature backlit hard keycaps with laser-etched legends. 1D as small as 4 mil; 2D as small as 6.6 mils. Refer to User’s Manual for depth of field performance. Accelerometer: Embedded accelerometer enables automatic or application-specific features such as screen rotation or system suspend. Supports VoIP / Vocollect Voice / Push-to-Talk applications; rear speaker >80 dB at 40 cm (15.7 in); front receiver and front panel microphone for handset audio communication and audio recording; Wireless Bluetooth® headset support. Device Management: Intermec SmartSystems™ provides a single, integrated environment for hands-free deployment and management of devices on-site or remote. Also compatible with leading third party data and device management products. 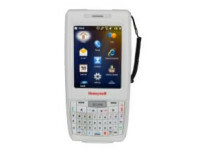 ScanNGo for easy barcode based enterprise-wide device provisioning. 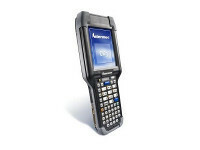 It can be used to download device management software from Intermec ISVs. CloneNGo, a peer-to-peer device management enables simple device cloning, eliminating the need to use a management console for device provisioning. Ready to accommodate field-attachable RFID reader handle via wired (USB) or Bluetooth®, allowing you to upgrade to RFID in the future without replacing the whole device.